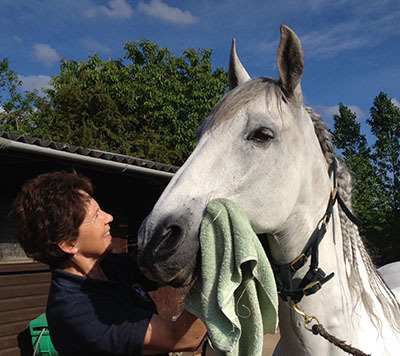 Dressage Trainer, Freelance riding instructor, Surrey, England. In 2016 a friend persuaded me to try some Forever Aloe drinking gel. She was so passionate about its health benefits and how it had helped her and her animals, I said I would give it a try. I had no idea when I started the gel that I was going to find a reduction in my migraines! I was just taking it as an all round supplement. I've suffered from migraines for years and tried alternative remedies without improvement, and some I didn't try because there could be potential side effects with them. I'm pleased to have found a natural supplement that has had this effect when I wasn't expecting it. I have been so impressed with the Forever products that I've tried and the health benefits that I've felt for myself, and seen in others, that I am now a Forever Living Distributor. It's great to be able to share them with other people who are interested in natural products. I love the fact that it's all about health and wellness for us and our animals. Forever Living was started in 1978 and is available in over 160 countries. They give a 60 day money back guarantee on all products if you are not satisfied. Forever Living products are not tested on animals and all the Aloe Vera is grown naturally without using chemicals. Please give me a call or email if you would like to know more. My favourite product has got to be the Aloe hand and face Soap. It's not just for me, it's great for bathing Ligero and my dog Khan too!.